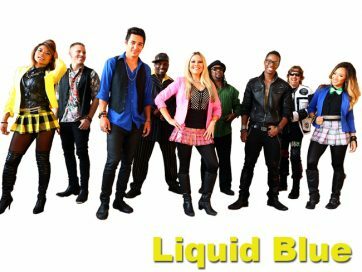 Liquid Blue is the most accomplished and highly acclaimed Party Show Band in the high-end Event business. This San Diego based LIVE Band ensemble has performed in more than 100 countries and hold a Guinness World Record®. In addition to their unparalleled success as an elite cover band the group has also reached the Top-10 on the Billboard Dance Chart. Named "Entertainment Act of the Year" (Biz Bash Choice Awards) as well as "Entertainer of the Year" (Event Solutions Spotlight Awards). Yet they are equally enjoyed in any Wedding Venue or at any kind of Special Event as a Premier Corporate Party Band with the Musical expertise to perform for Any audience all while including their trademark extra-special touch of flair and Showmanship that Party Guests rave about and will leave them wanting more. Liquid Blue features a line-up of Southern California A-list talent. Grammy winning musicians and American Idol Hollywood finalists! On the female side, fronting the group is the multi-talented BlueGirls® trio. There is also an optional horn section available, BlueBrass® and a DJ is always included.